Donald Trump returned to the White House today for the traditional Easter Egg Roll, but he might have done better for himself if he’d remained at Mar-a-Lago instead. Trump forgot to put his hand over his heart during the National Anthem, until his wife prompted him. 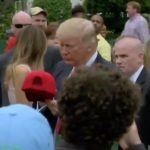 But then things got even worse when a kid in the crowd asked Trump to autograph his hat.